According to Ziwi Peak co-founder Peter Mitchell, this brand is all about selling a little piece of New Zealand’s food products and lifestyle to the rest of the world. 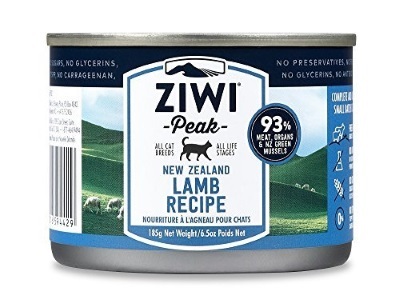 The taste of New Zealand is a hit among pet food consumers—Ziwi Peak is rated as one of the best cat food brands on the market, but is it a healthy, high-quality choice for your cat? Let’s find out. We’ve analyzed Ziwi Peak and graded it according to the We’re All About Cats standard, evaluating the brand on species-appropriateness, ingredient quality, product variety, price, customer experience, and recall history. Here’s how it rates in each of these six key areas. 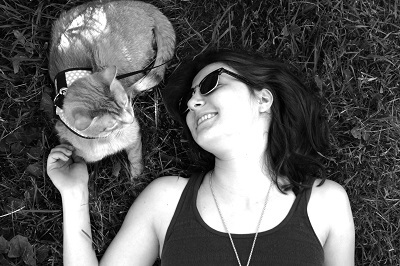 We give Ziwi Peak cat food a 48 out of 60 rating or an A- grade. Kimberly and Peter Mitchell started developing Ziwi Peak in 2004. Before Ziwi, Peter worked in a different part of the meat business—he sold commoditized ingredients or what Ziwi Peak USA director Nigel Woodd calls “the nasty stuff”. Their experience in the meat industry made Kimberly and Peter aware of the growing demand for all-meat pet food. The Mitchells started working with slaughterhouses to develop a system for recovering waste meat, then designed an air-drying system that would make the meat suitable for export. The result was Ziwi Peak air-dried food. An innovative air-drying process differentiated the original Ziwi Peak products from traditional kibble and helped the company gain worldwide recognition. Sourcing most of their ingredients from sustainable New Zealand farms, ranches, and waters gives Ziwi Peak what they call “The New Zealand Difference”. New Zealand’s warm, temperate climate gives Ziwi Peak year-round access to free-range, grass-fed local cattle, sheep, and deer. All of their fish ingredients are caught in sustainably-managed fisheries in the southern oceans of New Zealand. New Zealand’s strict bio-security protects livestock from infectious diseases, including BSE (bovine spongiform encephalopathy), West Nile virus, rabies, chronic wasting, and foot and mouth disease. All of their ingredients are sourced from export-certified facilities that meet stringent New Zealand safety requirements. Ziwi owns and operates dry food manufacturing facilities in Mount Maunganui and Christchurch, New Zealand. Their canned foods are made by a manufacturing partner also located in New Zealand. Has Ziwi Peak cat food been recalled? Ziwi Peak has never been recalled. What kinds of cat food does Ziwi Peak offer? Ziwi Peak’s cat food selection includes several varieties of both dry and wet cat food. Ziwi Peak offers 5 air-dried cat food recipes. Because they’re made using a twin-stage dehydration process, Ziwi Peak foods don’t require the starches and grains present in most extruded foods. This allows their dry foods to have exceptionally low carbohydrate content compared to kibble. Listed as one of the best cat dry cat foods on the market, their air-dried foods are 96% fresh meat, organs, bone, and seafood, including 3% green-lipped mussel and 7% tripe for palatability and digestive support. Ziwi Peak dry food is calorie-dense. Each 2 oz scoop contains at least 263 calories—that’s more than some cats need in a day. Ziwi Peak has 25% more calories per ounce than the average premium kibble and 63% more than the average hydrated freeze-dried food. Each bag comes with a scoop to make sure you don’t give your cat too little or too much. The brand offers six canned cat food recipes. Ziwi Peak’s canned cat foods are 92% meat, organs, and bone, including 3% green-lipped mussel and 7% species-specific tripe. In addition to meat and seafood, Ziwi Peak canned cat foods contain chickpeas and a variety of vitamins, minerals, and amino acids. All of their foods are grain-free and made without any artificial colors, flavors, or preservatives. This popular recipe is primarily made from lamb meat and organs, along with chickpeas and a variety of synthetic vitamins, minerals, and amino acids. In addition to lamb muscle meat, the food contains lamb liver, lung, kidney, tripe, heart, and bone. It’s made with green-lipped mussel. This natural source of glucosamine and chondroitin helps support joint health. Chickpeas add significantly to the food’s carbohydrate content and are a source of plant protein. Ziwi Peak includes this legume as an alternative to traditional binders. Overall, this is a meat-based food that’s high in protein with moderate fat and moderate carbohydrate content. There are 185 calories in each 6 oz can or about 30 calories per ounce. Lamb, Lamb Broth, Lamb Liver, Lamb Lung, Lamb Kidney, Chick Peas, Lamb Tripe, Lamb Heart, New Zealand Green Mussel, Lamb Bone, Dried Kelp, Minerals (Zinc Amino Acid Complex, Copper Amino Acid Complex, Manganese Amino Acid Complex), Vitamins (Vitamin E Supplement, Vitamin B1 Supplement, Folic Acid, Vitamin D3 Supplement). This venison-based food contains venison muscle meat, venison broth, and a variety of nourishing deer parts not typically found in cat food—liver, lung, heart, kidney, tripe, and bone appear on the ingredient list. In addition to venison, the food is made with Ziwi Peak’s standard green-lipped mussel, which is a carnivore-appropriate source of glucosamine and chondroitin. Not-so-carnivore-appropriate is the inclusion of chickpeas. Ziwi Peak adds chickpeas to their wet foods as a less-controversial alternative to traditional binders like agar-agar, but chickpeas increase the food’s carbohydrate content by 8% on a dry matter basis. There are 85 calories in each 3 oz can or about 28 calories per ounce. Mackerel and lamb appear to be the primary protein sources in this air-dried cat food. This air-dried food is made primarily from meat— wild-caught mackerel, lamb meat, lamb organs, heart, and bone constitute 93% of the recipe. Like all Ziwi Peak air-dried foods, 3% of the food’s animal content is green-lipped mussel, a natural source of glucosamine and chondroitin. The food is supplemented with chicory, lecithin, dried kelp, and a variety of vitamins, minerals, and amino acids. Overall, this is a meat-based food with high protein content, moderate fat, and low carbohydrate content. There are 273 calories in each 2 oz scoop or 137 calories per ounce. What do customers think of Ziwi Peak cat food? Ziwi Peak receives primarily positive customer reviews. Happy customers praise Ziwi Peak’s ingredient quality and say that it improved their cats’ health and energy. Unhappy customers typically talk about poor palatability. Some wonder if Ziwi Peak food contains too much bone. Whether they give the brand one, three, or five stars, reviewers agree on one thing—Ziwi Peak cat food is expensive. The food’s price comes up in almost every review, whether negative or positive. How much does Ziwi Peak cat food cost? 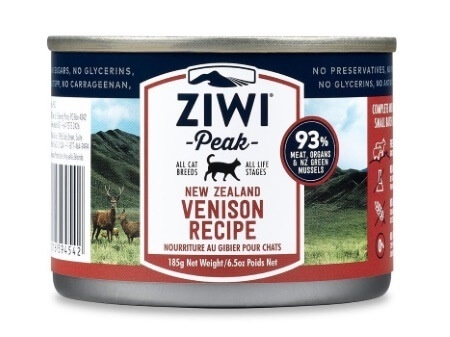 If you choose Ziwi Peak’s venison canned food and follow their feeding instructions of one ounce of food per pound of bodyweight, it will cost roughly $8.28 per day to feed a 10-lb cat. If you opt for 3 oz instead of 6.5 oz cans, your daily feeding cost shoots up to $11.41 per day. Compared to their wet food, Ziwi Peak air-dried food costs more per ounce, but it’s calorie-dense, so you’ll need to feed your cat about 2 oz or one scoop each day. This adds up to $2.68 per day. Overall, is Ziwi Peak a good choice? If you’re willing to spend $2 to $8—or more, depending on your cat’s appetite and which size cans you choose—on cat food every day and are passionate about responsible sourcing and ingredient quality, Ziwi Peak might be a great choice. Ziwi appears to be one of the world’s most sourcing-conscious pet food companies. The use of safe, ethically-raised meat is one of their biggest selling points. Nutritionally, Ziwi’s air-dried foods are where the company shines. Dry food is notoriously high in plant content, from plant protein fillers to starchy binders. Ziwi Peak out-classes the competition with an innovative dry food that’s low in carbohydrates and made primarily from fresh, minimally-processed meat. Their wet food is also good, representing a variety of organ and muscle meats typically found in vaguely-named, potentially low-value animal by-products. Ziwi Peak wet food is higher in carbohydrate content and isn’t as innovative or exciting as their dry foods. 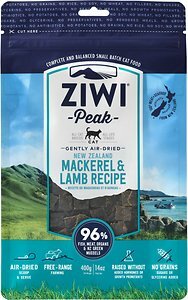 Where is Ziwi Peak cat food sold? Ziwi Peak is sold in independent pet specialty stores and holistic veterinary offices around the world. Online, you can buy it through Amazon, Chewy, and other pet product retailers. 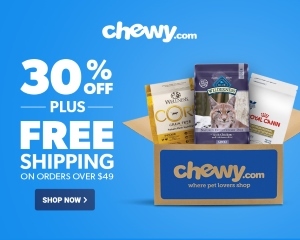 Click here to shop for Ziwi Peak cat food on Chewy.